A tourist will find this information sign the ideal place to read up on the area, stretch their legs and take in the scenery of the Arctic Circle in the Yukon Territory. A long stretch of gravel highway will eventually bring you to this sign which gives tourists some valuable information about the Arctic Circle in the Yukon Territory. This beautifully sculpted sign is great place to get out from behind the wheel of the car to stretch, breathe in fresh air and enjoy the scenery of the Arctic Circle on sunny days. Sign denoting the Arctic Circle. 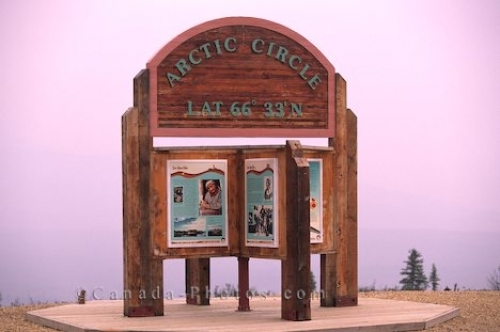 Picture of an information sign about the Arctic Circle in the Yukon Territory surrounded by the pinkish tinged fog.